I haven't used a Mepps for years so the other day when I was rooting through my box to sort out the lures and I found a size 2 Mepps unused I thought I'd give it a try for seatrout. 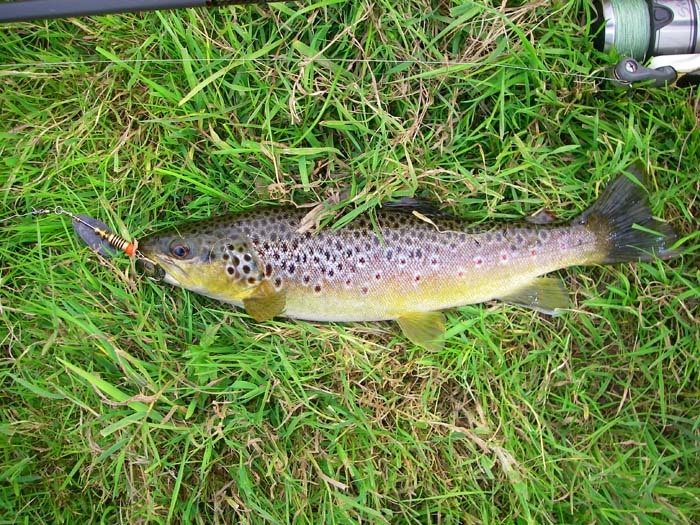 As it turned out I didn't catch any seatrout but I had one browny after another. The biggest was no more than a pound-and-a-quarter but I had an entertaining afternoon catching them. I was just having my 'last casts' on the way back to the car when I came to a wide shallow riffle. I cast straight upstream along my bank and, for once, the lure dropped exactly right, about a foot from the bank. Knock over the bale arm and start a brisk retrieve to keep the lure ticking over and suddenly I was into a fish. It seemed much more powerful than the trout that I'd caught and for a few seconds I was hopeful that it might be the target sea trout. However, it didn't show any sign of jumping and as it dropped downstream it kept as deep as it could go. 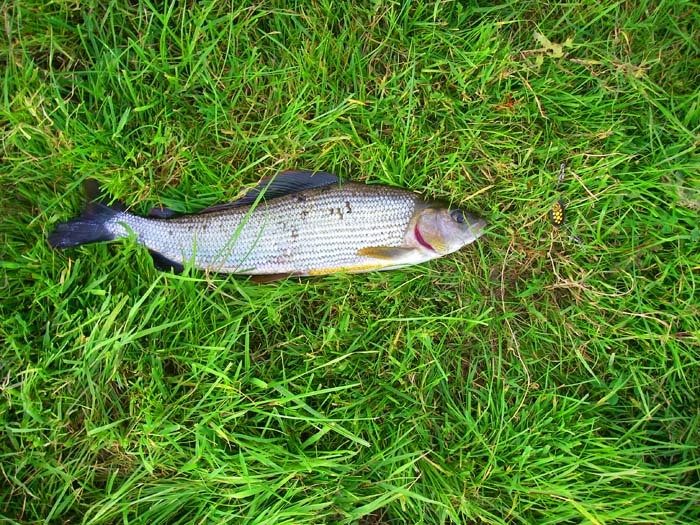 When it eventually hove into view I was pleased and surprised to see that it was a grayling. Not much bigger than the biggest trout that I'd had but a lot stronger and less splashy. Over the past forty years or so I've had one or two grayling when I was spinning - most of them on Mepps. I know that in the Arctic Circle spinning is a recognised method for catching these fish but in my local rivers, although grayling are often abundant and grow to a good size they don't go mad for spinners. Anyway, it was a nice way to finish off the session.